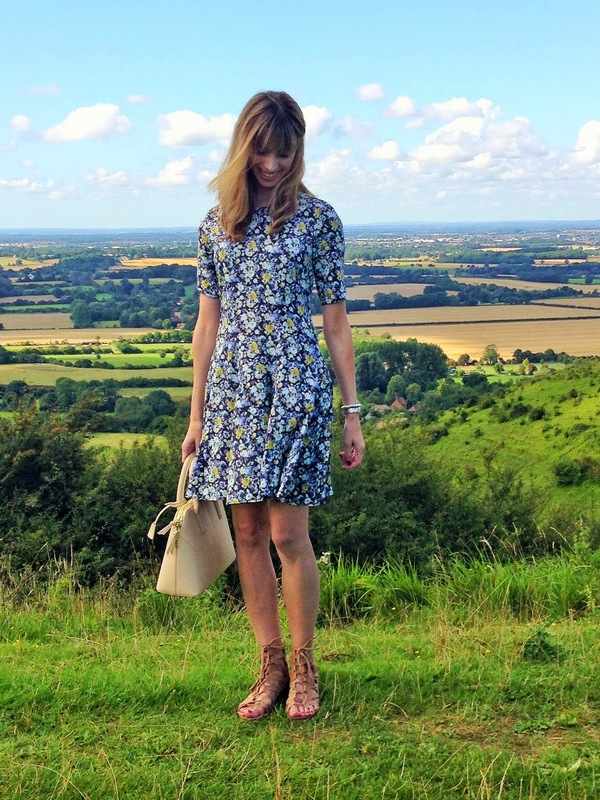 The main subject of today's post is this H&M dress. However, I don't think I can possibly write it without sparing a few words for the bag and shoes too. I hope you don't mind. ;-) All three items are new and I'm obsessed. OBSESSED, I tell you. Then there's the bag. Ah, the bag. It makes me feel all grown up and put together. It's from Zara, which is my absolute favourite place to buy bags at the moment and has been for some time. I honestly think they do the "could be designer" thing like no other store on the high street. I love everything about this one - the shape, the size, the gold zip. It's got a long strap you can attach when you need your hands free (for ease of shopping, obvs) and little gold feet so that the bottom doesn't get dirty when you put it on the ground. A small detail, but so important! There's a similar (though not identical) black version, which I clearly need as well. So, onto the dress. I fell in love with it as soon as I saw it in the window of my local H&M. I don't know if anyone else has this problem, but all my dresses tend to be either evening wear or massively inappropriate outside a beach holiday environment. I could see immediately that this one was different. It's a lovely length, stopping just above the knee, and the high neckline and modest sleeves make it so easy to wear when I'm out and about. I could also see straight away that this dress is a perfect "transitional piece". It's light and floaty enough to wear with sandals and bare legs while the weather is still warm, but because it's fairly "covered up" and has a dark base colour, I can see it working just as well with tights, boots and a leather jacket. Since buying it, I've noticed that H&M have introduced another colourway, black with a cream print, which is equally lovely. Do we think I should get it? At £19.99 it would be rude not to, no?! One little pointer in case you're interested in the dress - I usually wear a size 8 in H&M but got this in a 6 as it's generously cut. What do you think of this dress? Are you thinking about new season clothes yet or are you still in full-on Summer mode? This dress is adorable Kate. I love the ouutfit! So cute! This whole outfit is just gorgeous! I love the shoes so much! Oh wow what an absolutely gorgeous outfit! Loving that dress, and I'm in search for a new bag so I'll definitely have to give Zara a go! Your dress is beautiful - the print, the colours, the style.. Everything. I think when it gets colder it would look lovely paired with a thin cardigan and some ankle boots! Your bag is lovely too by the way! I like your look.Bag, sandals ,dress ...everything. By the way nature ,and place where you took photos are fantastic. Hope you will visit my blog ,and we follow each other. Now I´m following you in Bloglovin´#126 I hope your follow me back! Beautiful dress sweetie!! :) So cute!! 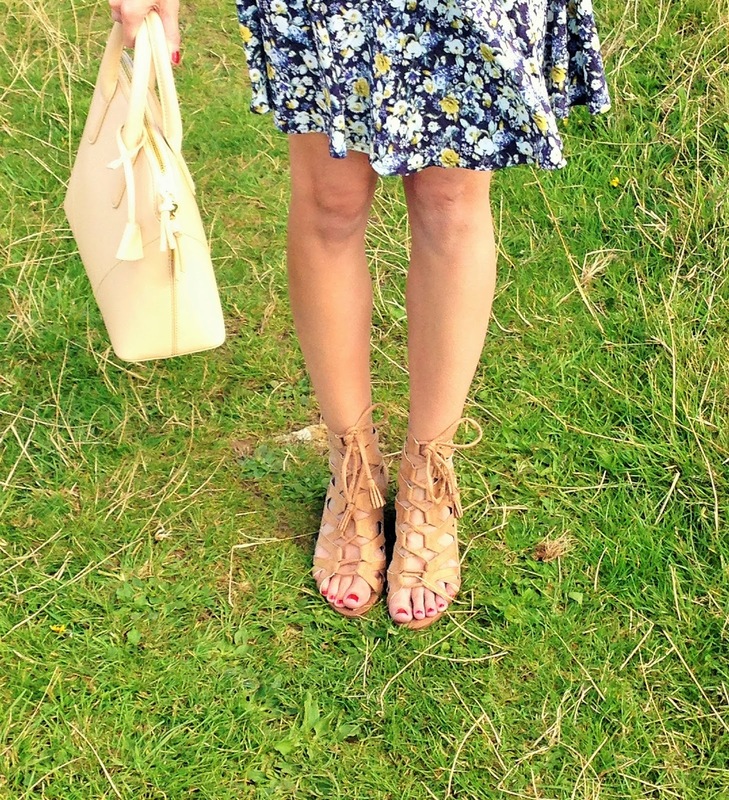 Absolutely love the sandals and bag, so stylishly paired with that beautiful floral print. I can imagine the red coloured bag must be just as gorgeous too! I too have been gearing my mind towards AW clothing, but it's so hard when the summer has just simmered away and the clothes are still so gorgeous and beach-y ready! :| I think these are such good picks though, you hit the nail on the head by calling the dress a transitional piece; I can see it working stylishly against all seasons! 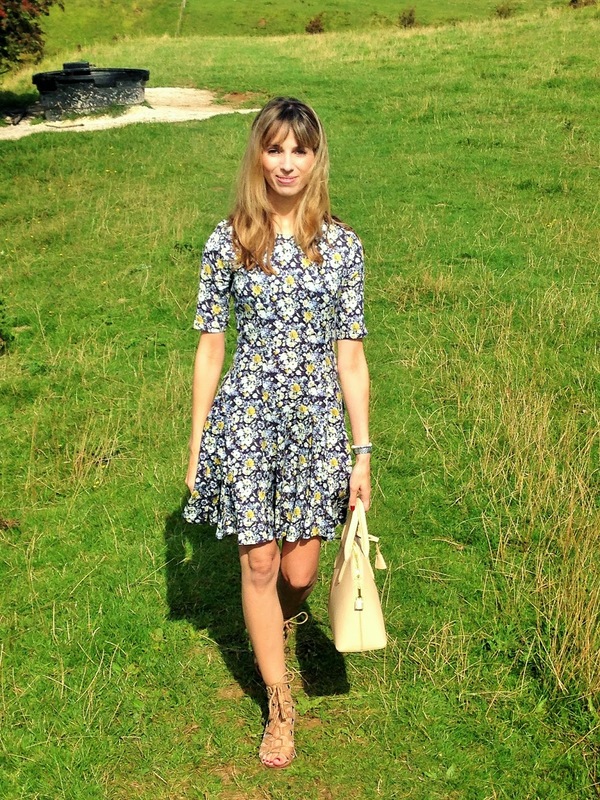 Such a cute dress, perfect for a summer stroll!